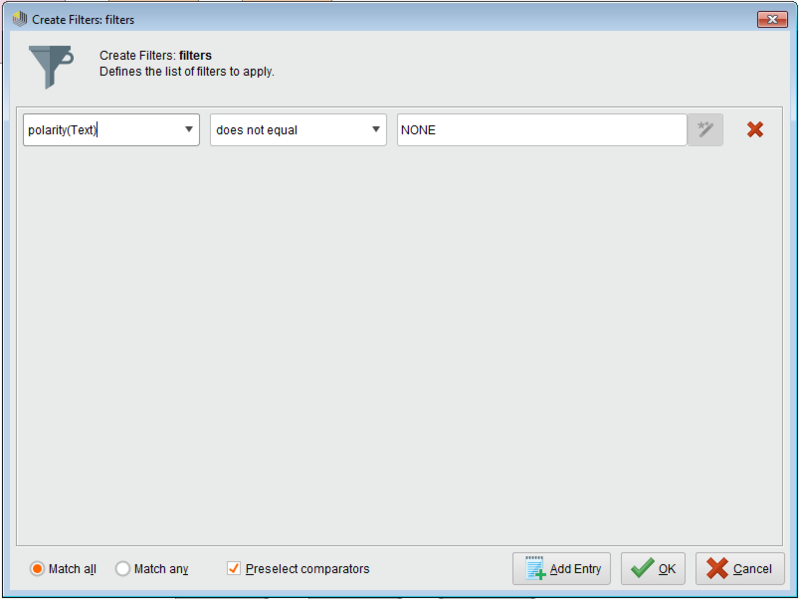 This initial part of the tutorial is exactly the same as in our previous RapidMiner tutorial. So please follow the instructions there to import the data set, changing the format some of the columns, store the data set and retrieve it into the Process modeller. 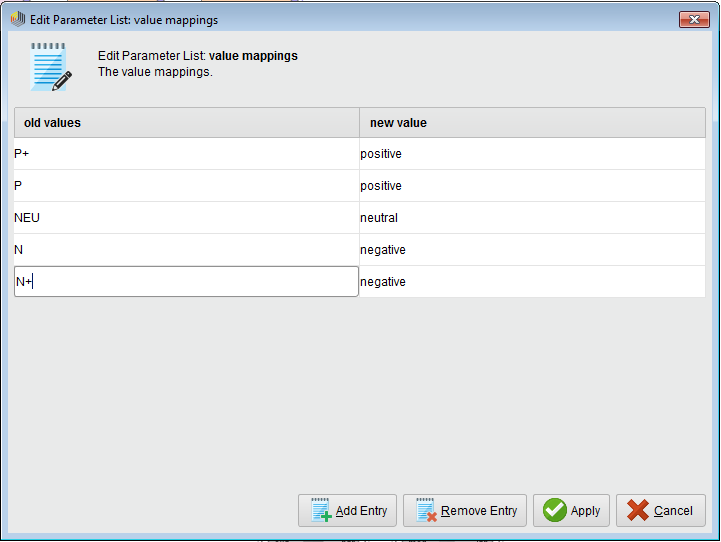 Now, once we have the dataset successfully loaded into our process the next step is to perform the sentiment analysis – we shall do this by using the MeaningCloud extension for RapidMiner (initially, make sure that you have the extension itself installed). Again, this is something that we already did in our previous tutorial. Find the “Sentiment Analysis” operator and connect it in the process. Do not forget to enter your License Key as a parameter. 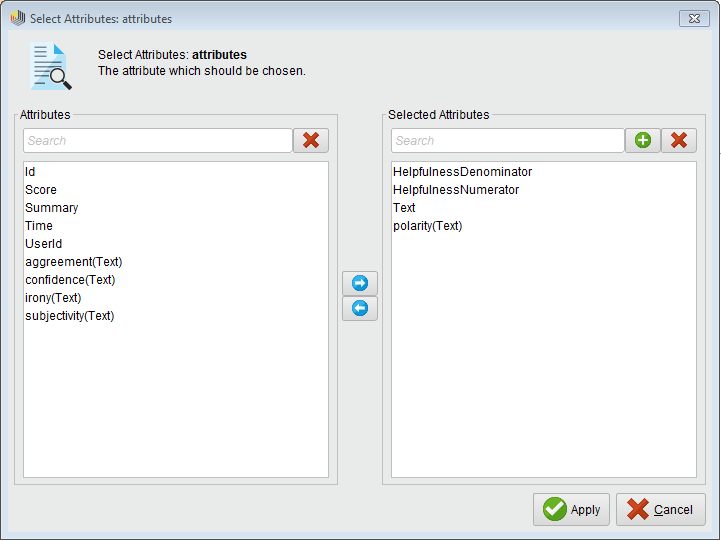 Also, in the Parameters section choose the Attribute – Text as well as the language that is used in the text (English – en). You may have noticed that we will not use the Score variable in the prediction. The Score and the Polarity (our class label) attributes are highly correlated which means that in our extracted rule model the Score variable will have a high impact on the classification – this is not something we desire. It is a better idea to base our model on the actual text content (topics extracted) as well as on the helpfulness of the review. Now, we are finally ready to proceed to the most interesting part and train our model! 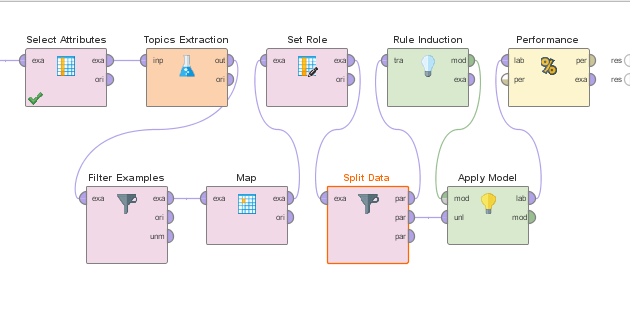 To successfully predict the sentiment (negative, neutral and positive) we will use a technique called “Rule Induction” – available in RapidMiner through the operator with the same name. This is a standard machine learning technique which uses the RIPPER (Repeated Incremental Pruning to Produce Error Reduction) algorithm. We will not go into details on how this works, but if you are interested feel free to read the operator’s documentation or take a look at the paper “Fast Effective Rule Induction (1995)” by William W. Cohen. Add the operator to your process and connect it to the first output port of the Split Data operator – this is important, the order of the output ports of the Split Data operator respects the order of the data that we split in the previous step. You do not need to adjust anything in the parameters of the operator, just leave everything as it is. Don’t want to go through all the process creation steps? Just download the process specification Amazon fine food reviews dataset here and import it into RapidMiner by using the File, Import Process option. Let’s now run the process and see the results of our work until now! 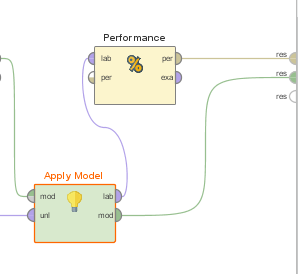 Click on the Play button on RapidMiner button bar. Be aware that the execution may take quite some time, so be patient! correct: 811 out of 1025 training examples. What we can see from the Rule Induction operator output is the total set of rules that we have managed to extract from our dataset along with the correctly classified training set examples. Here, it is easy to see how each concept and/or entity relates to the classes. Here, the first part (con_$ ≤ 0.500) states that the text analyzed should not have the concept of dollars ($) in it; the second part (HelpfulnessNumerator > 0.500) states that at least one user should have found the review helpful; and the third part (con_mistake ≤ 0.500) states that there should not be a mention of the concept of mistake in the review text – in this case the review is positive (which was the case for 340 out of 441 cases). It is quite interesting to see that in most cases when people don’t talk about the money in a product review, the review tends to be positive. When people talk about snacks, the review tends to be positive – well, who doesn’t like snacks?! We can with quite a bit of certainty say that the absence of the concepts of “money” and “mistakes” make the list along with the presence of the “tea” entity and of course, “snacks”! As we can see from the PerformanceVector, we have actually achieved an accuracy of 78.86% which is quite impressive – good work! You may have noticed that most of the examples that have been classified correctly are within the positive category. These results are quite nice, but one way to get even better results is to make a custom dictionary when extracting the topics and performing the sentiment analysis using MeaningCloud – more information about this feature can be found on the MeaningCloud website.